Pocono Lake on the lake: Five bedrooms and three bathrooms with a beautiful gas fireplace that lights with the touch of a switch. When guests first enter the door they say the pictures do not do it justice. The view of the lake from almost everywhere in the house is no less than awesome. Large sliding glass doors leading to the massive rear deck provide even more of a view. Our kitchen is well equipped for the occasional or gourmet cook. Every kind of spice is provided in our spice drawer. We have pots and pans in many shapes and sizes and a food processor, 14 cup coffee maker with filters, a coffee grinder, waffle maker, panini maker, blender, angel food and bundt cake pans, cookie sheets, a 4 slice toaster. Our dining area seats 10 comfortably at our oak wood table with more chairs available in the bedroom to use with either a card table or you can use our harvest table. More seating is at the island bar where you can watch the cook or just gather for snacks. The living room has a very large leather couch and recliner when you can watch TV on our 44" LED TV, or watch some of the movies in our collection on our blu ray player. Two of the bedrooms which each have queen beds are located on the upper level. The master bedroom has a bathroom attached. The other bedroom uses the bathroom at the end of the hall. Downstairs there are three more bedrooms. The first has a queen bed and bunk beds, the middle bedroom has a queen bed and the last bedroom has a queen bed and a single bed across from the full bathroom with tub/shower. Next to the last bedroom downstairs is another large sitting room which features a 40" TV, DVD player, VCR player and games to be played on the coffee table or card table. There are exercise DVDs for the guest who wants to stay in shape. Extra chairs are available here too. We provide hand soap in each bathroom in addition to paper towels and windex for a quick and easy clean-up. Our laundry room features a modern HE washer with detergent provided and a super fast dryer, ironing board and Iron. Wifi is provided with no sign in needed. Outside on the patio below the deck is a seating area with lounge chairs and a large picnic table. I was an RN for many years before and during the time we raised our five children in Philadelphia. My husband had his own executive search business and I also worked as office manager for him for many years. Cook on the large Weber grill right outside the kitchen or sit on the deck to watch the early fishing enthusiasts or admire the birds and the humming birds that come to our feeders in season. Our kitchen is well equipped for the occasional or gourmet cook. Every kind of spice is provided in the spice drawer. Pots and pans in many shapes and sizes including disposable metal pans. A food processor, 12 cup coffeemaker with filters, coffee grinder, waffle maker, panini maker, blender, angel food pan, bundt pan, cookie sheets, 4 slice toaster. Our dining area seats 10 comfortably at our rustic table and more chairs are available to use with either a card table or our harvest table. More seating is at the island bar where you can watch the cook or just congregate for snacks. The living room has a very large leather couch and recliner where you can watch TV, get a movie from Netflix or watch some of the movies in our collection on our blu ray player and our 44 inch Led TV. Two of the bedrooms on the upper level have queen beds. The master has a bathroom attached. Downstairs there are three more bedrooms. There first has a queen bed and bunk beds, the middle one has a queen bed and tv, the last one has a queen and single bed and tv. We provide hand soap in each bathroom; also windex and paper towels for a quick and easy clean-up. Next to the last bedroom is another very large sitting room featuring a 40" TV, DVD player where you can use the many exercise DVDs or the treadmill. Games can be played on the coffee table or card table. Comfortable seating on the large leather couch and love seat. Extra chairs available. Our laundry room features a HE washer with detergent provided, a super fast dryer, iron and ironing board. Step out from the master bedroom to enjoy the six to eight person hot tub conveniently located right outside the door. Imagine gazing at the gorgeous stars extremely visible in the clear mountain sky. Outside on the patio below the deck is a seating area with lounge chairs and a large picnic table. Our well kept fire pit area is the perfect place to congregate for a bonfire and for toasting marshmallows of making smores. We are right on the lake and you can swim or boat in any of our two kayaks, rowboat or two jon boats equipped with electric motors. We are close to outlets, a casino, three indoor water parks, hiking trails, shopping and movie theaters. Electric-turn on with the push of a button. The blower will come on about 20 minutes after start. Shed- We have life preservers, oars, electric motors, battery charger for the electric motors, beach toys, volley ball net. 2 Jon boats with electric motors, Must wear renter badges. tennis courts on Lake Lane. Must wear renter badges. We loved the layout of the house and it fit our family needs well. We did, however, have an issue when the washing machine stopped working while doing a load of laundry. The homeowner claimed it was our fault that we pushed in the reset button too far which broke the control board. They would not take any responsibility for the five-year old washer, which stopped during the wash cycle through no fault of ours. Instead they put all the blame on us for trying to reset it (as they instructed us), and then kept most of the Refundable Damage Deposit so they could put it towards the purchase of a new washing machine. The house was not ready at check-in time and we had to wait while the ice was chipped from the outside stairs; there was no salt available to make the stairs safe during the weekend. We were charged a Cleaning Fee, but the “light cleaning” instructions provided at the house basically meant cleaning the entire house. I received a call from this renter a maximum of two hours after arrival. She stated that she was doing her third load of wash when the washer just stopped. She said she had looked up how to repair a washer, unplugged it and re plugged it and nothing worked. Why would you be doing the third load of wash two hours after arrival. I asked the woman who checks the house for me (who had never had a problem with the washer) and she said she could not push the reset button as it was not able to be pushed. I was not able to get a repair person to come till Monday, after the renter left and he said that the reset button had been pushed to far in and it made the control board to fail. He charged me $64 dollars to come out and it would be $400 to fix the washer. I decided not to get the washer fixed but to purchase a new washer. I had no intention of purchasing a new washer till this took place and expected that my Maytag which was only 5 years old would last me for many years to come. It is costing me a lot more than $400 which I charged and to the best of my knowledge it was the renter's fault. I also called Homeaway and they told me that I could charge the $500 security deposit so I feel that I was being more than fair in charging $400. and having to purchase a new washer. As far as the steps not being cleaned, the person who plows came right over and cleared the steps even though, I believe the renters arrived early. The renter is also wrong in saying that my instructions mean to clean the whole house and this is just not true. Spacious warm and cozy lake cabin!! We had 12 people staying at this cabin for 2 nights and it was perfect! Large, spacious cozy and comfortable with beautiful views, a hot tub and a fireplace as well as enough bedrooms for everyone. The pictures do not do the house justice at all and we were so impressed with the place once we get there. The owner was extremely accommodating and the house had everything we could have needed. I would recommended 10/10 and hope to plan a summer trip here! Thanks for opening your home to us Rita! This is our 3rd year staying at 217 Patridge and it gets better every year. The house is beautiful, clean and very welcoming and has everything you could want. 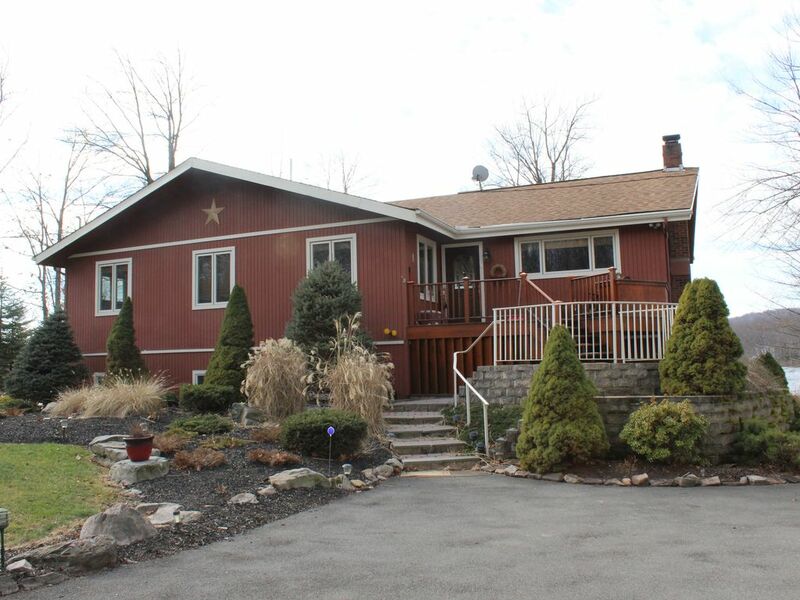 Hot tub, lake access & views, fire pit, plenty of space to house a lot of people, beautiful kitchen, fireplace, etc. Rita is easy to communicate with and the house is very reasonably priced. The only time we leave during our stay is to get the most AMAZING German Pancakes at Moyers! This place had it all: lake, deck, kayaks, fishing boat, fire pit and hot tub. Never a dull moment! We really enjoyed our stay. This house is listed as 13 guest sleeper but could easily sleep probably about 20. Very spacious and the upstairs living area gives you cabin feeling based on the design. Everything was clean and neat and functional and very cozy. The view in the backyard was more than amazing and pictures just do not do it justice Even in the winter with the lake frozen. The fire pit in the back has the perfect setup which benches which is great for story telling and marshmallows. I could see that the place would be better used during the summer so I plan on booking this place for the summer if we can find the dates available that is. If you go out in the backyard and walk maybe a 100 feet towards the left, there is a beach set up for the lake. Plus Walmart, Dollar General, Liquor Stores, are all nearby within 10 minutes. The parking area in front of the house parks about 8 cars. Big Boulder is about 20 mins away. Casino is about 30 mins away. Everything you need to enjoy, this house has it, literally. Everything in this review is true but I need to make a few comments. We take pride in keeping our home in excellent condition and the maximum amount of people which WE permit is 13 and this includes children. This is in consideration of the septic system, our responsibility toward our neighbors and the general upkeep of our home. Also we do not want more than six cars (maximum) in the driveway. The Pocono Mountains offers four seasons of fun and enjoyment to satisfy all persons such as local family attractions and outdoor activities. The area is famous for its natural scenic beauty and quaint historical towns nearby. The Pocono Mountain area is the favorite four-season playground in Northeastern Pennsylvania with activities such as skiing, air boarding at Montage Mountain,snowboarding, snow tubing, hiking, fishing, boating, shopping, golfing. 10 minutes from Jack Frost and Big Boulder Ski areas, Paintball, Penns Peak, 15 minutes from Mt.Airy Resort and Casino and 20 minutes from the Factory Outlet Mall. Security deposit of $500.00 required for each week ADDITIONAL RATE INFORMATION. Lease sent to you for signatures, booking will be confirmed when deposit is received. An additional fee of $100-$200 will be charged if house is not left in very clean condition. CANCELLATION POLICY-Rental payments returned if notified six weeks prior to rental date. Security deposit will be forfeited if unable to re-rent for your reserved time.